The rain let up enough for us to leave Seeley Lake around 1:30pm, with 55 miles to go to Lincoln. This was a big Pacific storm, and it was not done with us yet. Dark gray clouds scudded across the sky from west to east, pushed by a crosswind strong and gusty enough to throw the bike sideways. We held on tight. 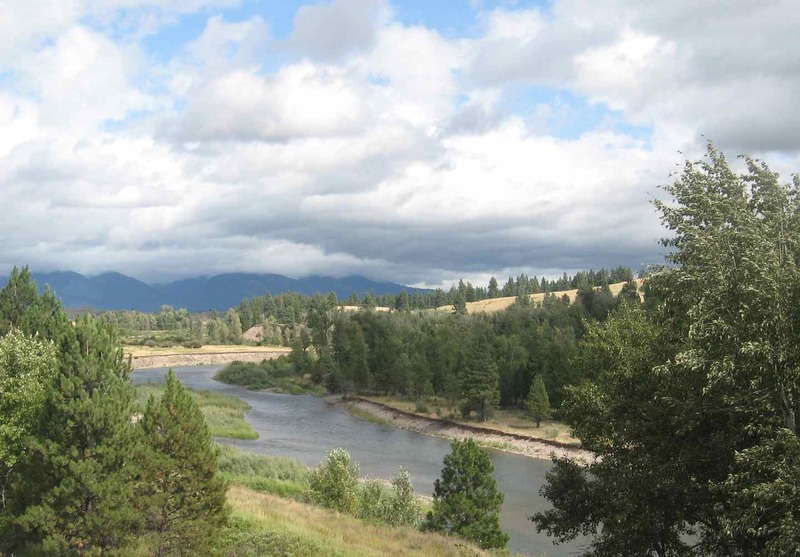 We rode through the Blackfoot-Clearwater Wildlife Management Area, which looked like a great place to see a bear or an elk, but we had no luck. 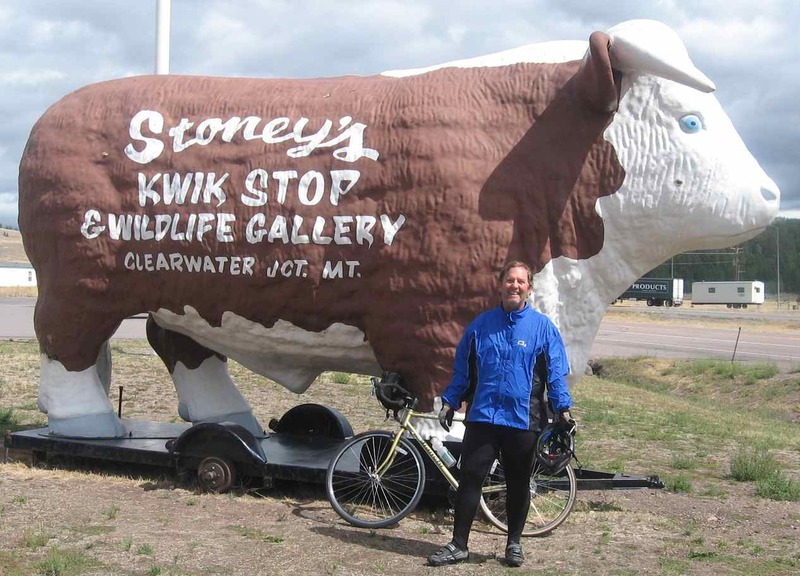 Fifteen miles down the road we reached the intersection with Montana Route 200, which had an ordinary gas station with an extraordinary fiberglass steer out front. We turned left and started heading east. When we turned, the wind became our friend – not a kind and gentle friend, but a fun, wild friend who might make you do things you shouldn’t do. Jim’s bike computer shows that our average speed on this trip so far has been about 5 to 8 miles an hour on uphills and 13 mph on flat ground. With the tailwind, we were doing uphills at 15 mph and level ground at speeds well above 20 mph. It was kind of like piloting a motorcycle; fun, but requiring quicker reflexes and more intense concentration. We did the 40 miles to Lincoln in about two and a half hours. 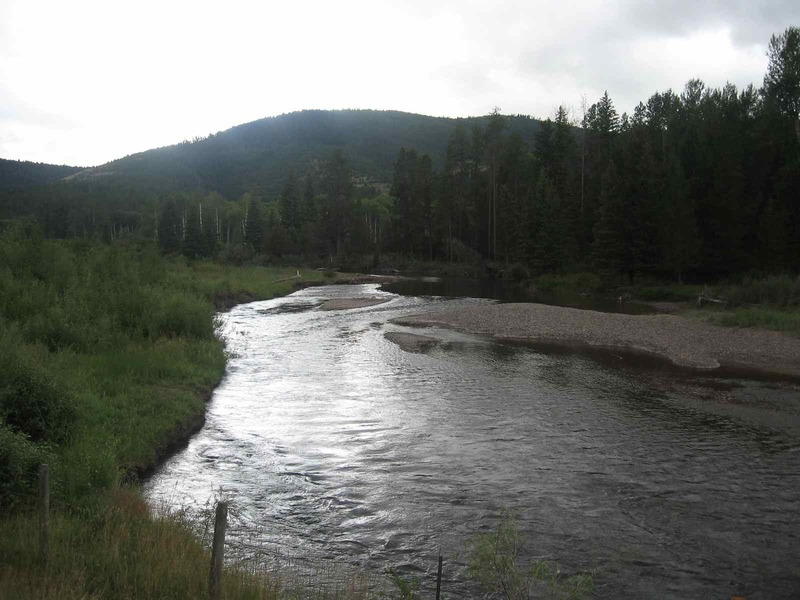 Our roadside companion was the Blackfoot River, which flowed broad and shallow through rolling hills. After a while we turned into a canyon and the river got smaller and faster. When trout anglers fantasize, this is what they see. The wind gusts in the canyon became more erratic and sometimes the wind turned on us, which was shocking. ONe tends to take a tailwind for granted after a while. Four miles from Lincoln, the rain finally came – horizontal sheets of rain blowing sideways from out of a side canyon, with nasty wind gusts. Shouting and cursing, we rode through it and met Sara and the camper at a private RV park on the edge of the village. Before long we were in full recovery mode, with a good hot shower, wireless internet, and a great meal at the Moose Joose Saloon. I pitched my tent next to a small stream that gurgled softly all night long, and slept ten hours. 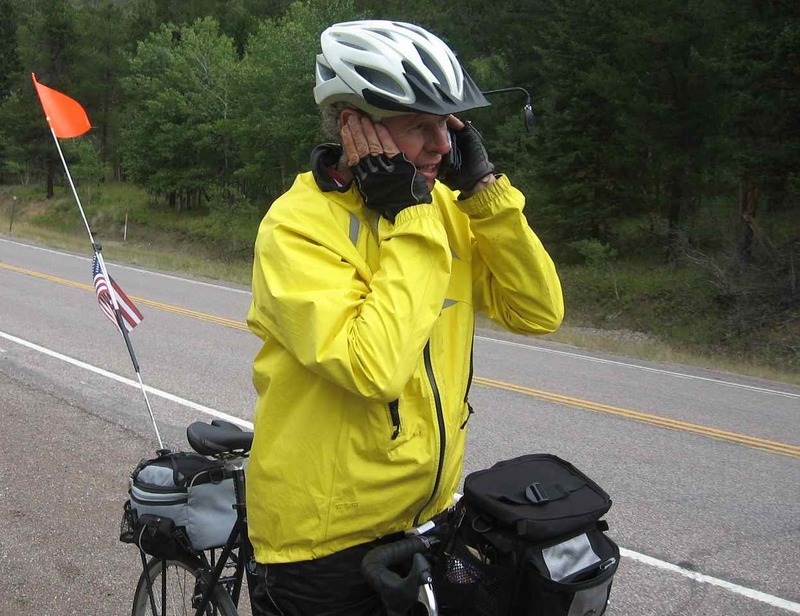 Helena,where we would pick up Paul, Jim’s younger brother, to ride with us through Yellowstone Park. 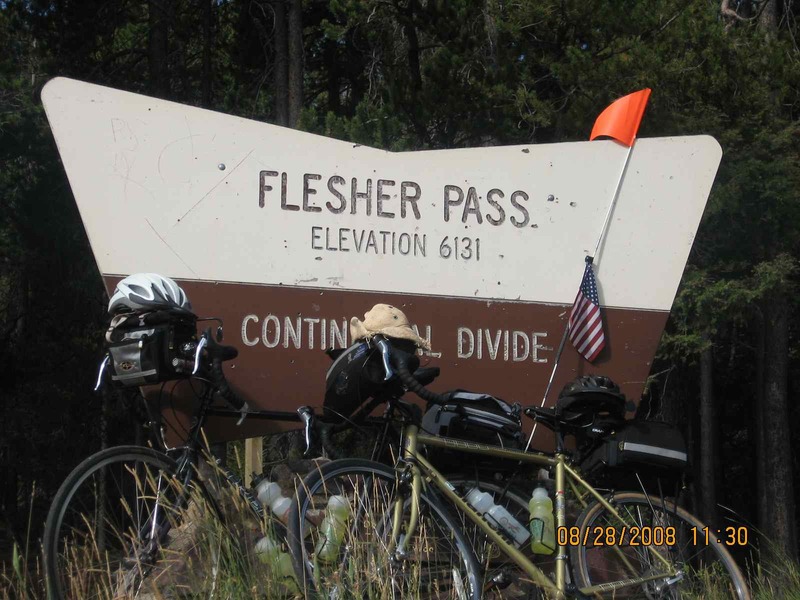 We were going over the Continental Divide today at Flesher Pass, elevation 6,200, a gain of about 2,000 feet. We rode through Lincoln, which seemed to be mostly a strip of bars with slot machines, and when we got to the end of town we were delighted to find that the tailwind was still there. Traffic was light, and the clouds were higher with no threat of rain. It was cold, but otherwise perfect weather for a ride. 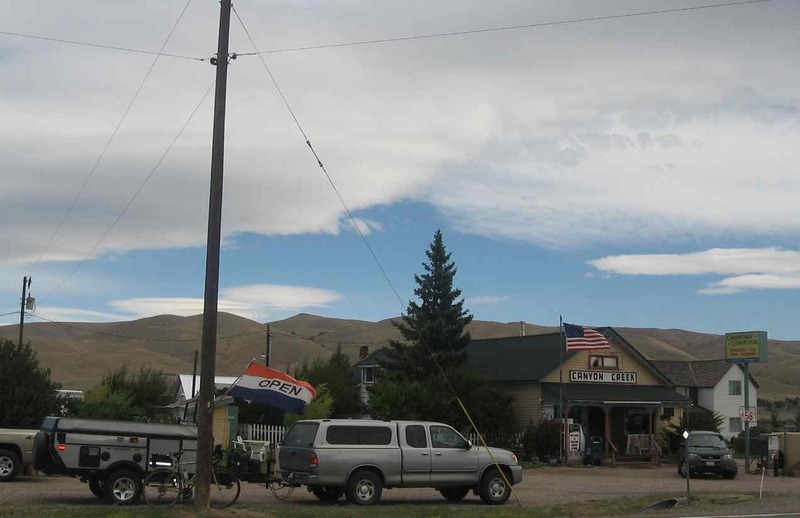 We quickly ate up ten miles and turned onto state route 279, the road to Flesher Pass. Asphalt trucks. Road Work Next 20 Miles. Expect Delays. In a car these would be frustrating developments, but to a bicyclist they are a ticket to a private road. All the way up to the top, we had long stretches with no traffic in either direction on a road that was paved yesterday. Then a slow-moving truck with a flashing light on top would pass us, followed by a line of slow-moving cars. Then we’d have another two miles of complete solitude. It was perfect. By 10:30 am we were at the Continental Divide. Flesher Pass isn’t much to look at – it’s below timberline, does not have a stunning 100-mile view, and on the day we passed through it was the parking lot for the construction crew. “This isn’t any worse than the climb from Naples to Branchport,” said Jim. But it WAS the Great Divide. We took out Al’s hat for the Official Photo and, hurried along by the wind, started down. We headed out for the last 15 miles of the day and saw a clear sign that we had crested the Rockies: lenticular clouds, which hug the updraft of the mountains and can run along the front range for hundreds of miles. 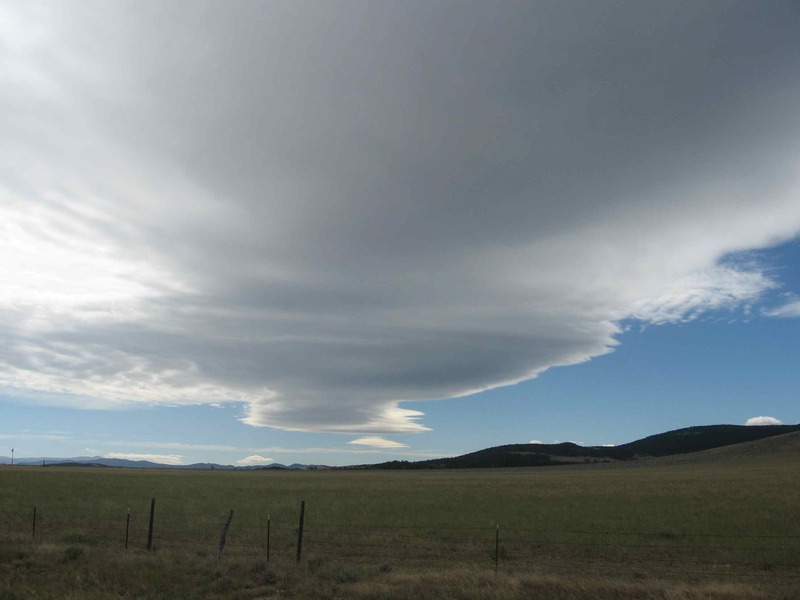 Lenticular clouds often have dramatic, aerodynamic shapes. The one we rode under today was like a wedge that ran from the northern horizon to the southern horizon. The road flattened out and just like that, we were in the northern sprawl of Helena. We rode through it and met Sara at White Sandy, a Bureau of Land Management campground on an artificial lake. After we set up, Jim and I ran to get Paul’s bike and meet him at the airport. 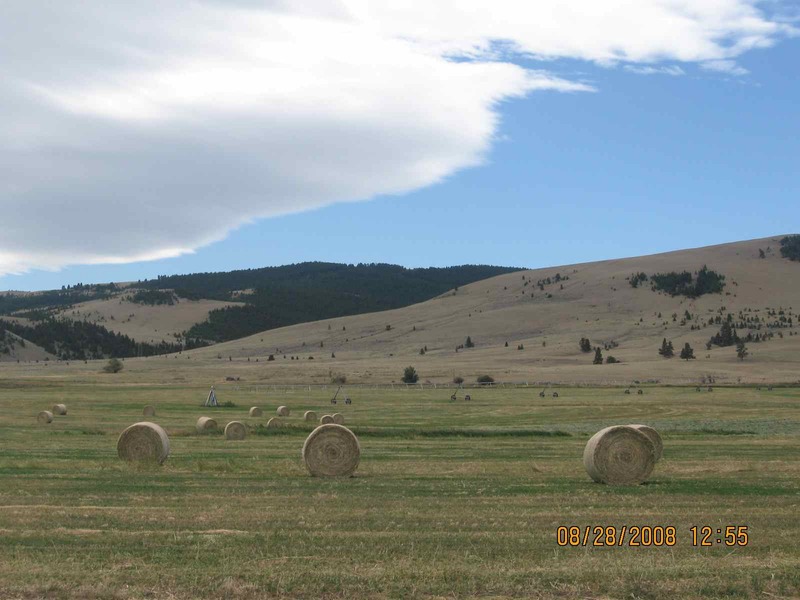 We also had time to run a few errands in Helena, which was the biggest city we had seen since we left Seattle.